Sony VAIO VPCEL25EN/B in budget price E Series laptop now available in Indian PC showroom. Sony VAIO VPCEL25EN/B affordable priced laptop power is provided by AMD Dual-Core Processor and integrated with with AMD Radeon discrete class graphics for smooth usage. Hey folks now we will discuss Sony VAIO VPCEL25EN/B laptop full feature , specification and what is actual price in India ( including Bangalore, Delhi, Mumbai, Pune, Hyderabad, Chennai and other cities in India). 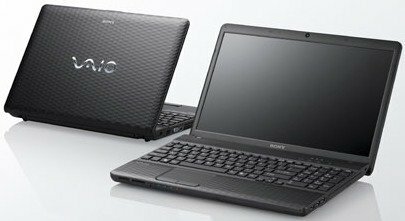 Reportdly, Sony VAIO VPCEL25EN/B comes with a 15.5 inch display, 2 GB RAM, 500 GB HDD, 0.3 mega pixels web camera for video chatting and AMD A50M FCH chipset. Connectivity wise The laptop from Sony VAIO VPCEL25EN/B also support Bluetooth, HDMI, USB 2.0, RJ-45 and Wi-Fi connectivity. This laptop is powered by VGP-BPS26 Lithium-ion battery for up to 3.5 hours of use.